OrthoBike is NOT Just a Recumbent Bike! The OrthoBike looks like a recumbent bike with handles. What makes it different? Is it really that different? Yes, it is more different than you can even imagine. It was designed from the ground up to provide therapy; it’s not an immigrant from the gym. Here is a picture of the Matrix R3x, a high-end recumbent fitness bike. It was built for the gym. A fine piece of equipment. Let’s compare it with the OrthoBike. But wait, aren’t they similar because they are both recumbent bikes? Right, like LeBron James and Dr. Albert Einstein are similar because both are human males. It’s the huge differences between them that interest us. The OrthoBike has the long arms that connect to the pedals to help you move the pedals when your legs can’t do it by themselves. You do it, not your therapist, unless you need help. They also help stabilize you as you sit and you can use them to help balance yourself as you mount and dismount. The R3x doesn’t have arms. It has a handlebar attached to the front post that forces the rider to lean forward. The upper body is mostly immobile—frozen in place—like riding a road bike. Check out the difference in the seats. The OrthoBike’s entire seat moves out of the way to help you step through and mount. 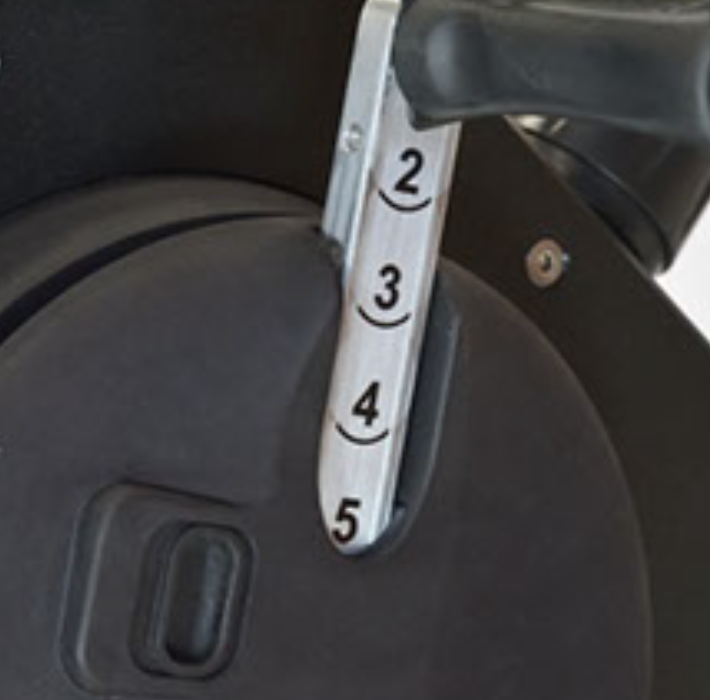 The R3x rider must be more fit and agile than a senior who just had her knee replaced or has been sedentary way too long and cannot easily step through and stretch to get on or off the seat. The really important difference between the OrthoBike and a fitness bike is the adjustable, variable-length pedal cranks. Here is a photo of the pedal crank expanded so you can see it better. Each number on its face represents a pedal crank length or degrees of knee flexion. You can push it all the way in (down) to get a short crank arm and about 60° maximum pedaling flexion (like right after surgery), and pull it out one number at a time to 5 until your knee is bending at 100° and more. There is no other bike that has this simple adjustable pedal crank. Why is this so important? If your knee doesn’t bend enough (not enough flexion), you can’t ride a fitness bike because you can’t rotate the pedal all the way around or it hurts with every rotation. The pedal crank is too long and forces your knee to bend until it hurts. The OrthoBike allows you to shorten the pedal crank until you can complete a rotation of the pedals without pain, regardless of how limited your flexion is. You get to exercise and start building your strength and getting flexibility in your knee, in your comfort zone. You will increase the flexion of your knee a little at a time until you can ride your fitness bike again. The OrthoBike is modular and comes apart in three pieces. You can take it home if you need extra therapeutic exercise. The R3x at 193 pounds is too big to put in the backseat of your car and carry upstairs. 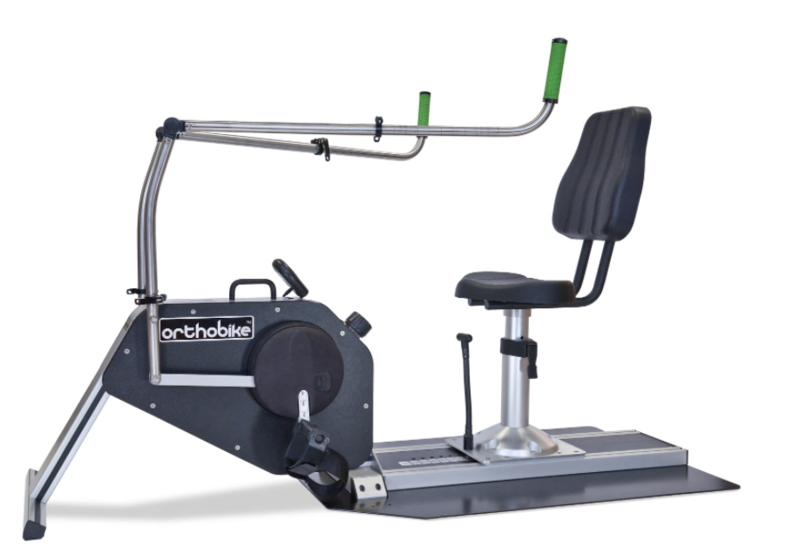 The OrthoBike is unlike any fitness recumbent bike. Nobody else offers an adjustable pedal crank system as useful, simple, and robust as OrthoBike’s, or the arms to help you in many ways and a great therapy seat to make mounting and dismounting a breeze. For those of you that have want to learn more about the Orthobike, head over to the website to check out the for patients section. This is a great resource to use or you can certainly contact either our Allentown or Upper Macungie offices at 610-841-3555 to set up a free screen or evaluation with the OrthoBike. For those of you who are looking for a little more info on preventing knee injuries see our Knee Pain Course. Through the course and following the steps above you will be well on your way to keeping your knees healthy and preventing injury!